Evoqua Water Technologies for retro? ts have dramatically increased. Besides having knowledge and expertise is applied at the right time, at an ef? cient system installed, ship owners and operators the right place and by the best team. The suppliers ongo- must choose a supplier who can provide not just a system ing commitment to the industry must be established to but a full suite of services and aftersales care worldwide. ensure support for the lifetime of their vessel. Additional adapt offerings to provide compliant systems. These strategic agreements with respected global provid- off of ship owner’s shoulders. In response to this, Evoqua have aligned themselves with suring all the critical knowledge and expertise is applied a number of renowned global organizations, Venteville & at the right time, at the right place and by the best team. Treatment System rine provides servicing and presence in 900 ports. 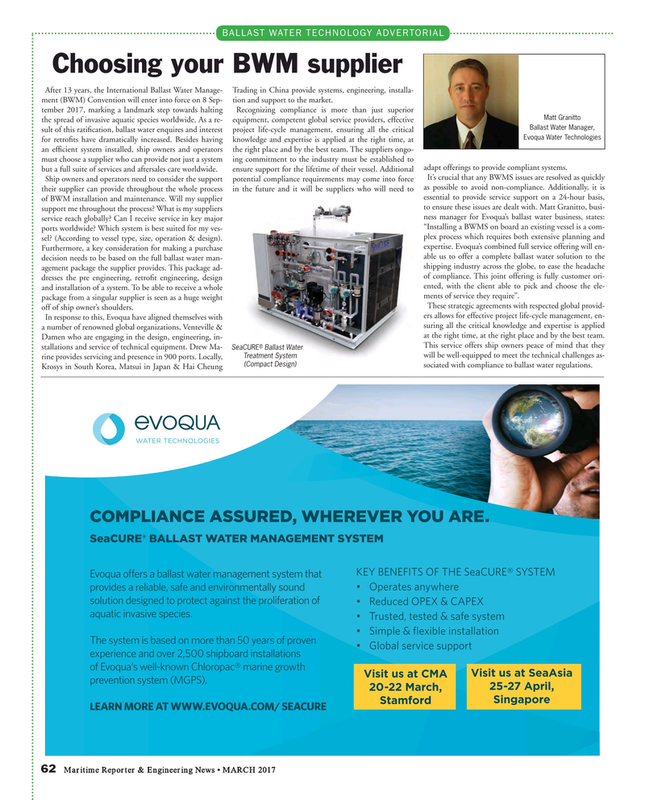 Locally, (Compact Design) sociated with compliance to ballast water regulations. Visit us at CMA Visit us at SeaAsia prevention system (MGPS).